The previously featured band, Kaira Ba will will playing The Pour House this Thursday, May 1. They will be supporting Sierra Leone's Refugee All Stars for an inspirational night of African music, tradition, and culture. 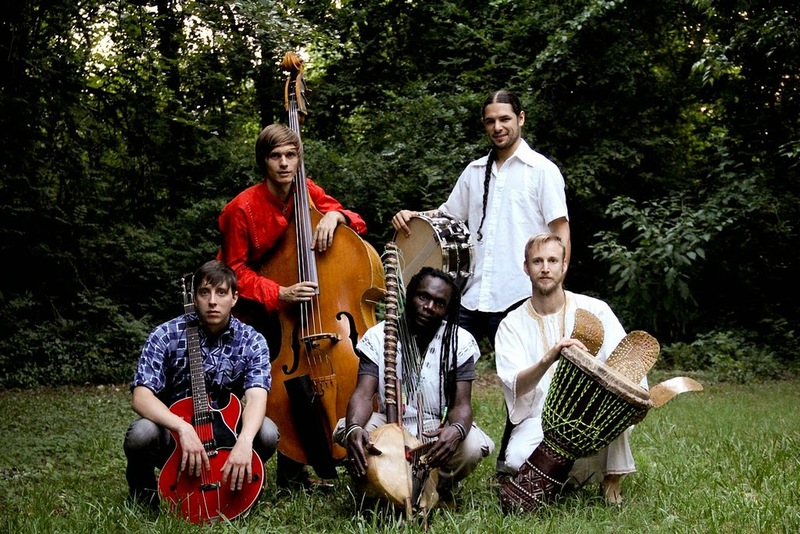 Kaira Ba is a guitar and experimental kora dance band founded by Senegalese griot musician Diali Keba Cissokho. He brought together band mates, John Westmoreland (guitar), Jonathan Henderson (bass), Austin McCall (drums), and Will Ridenour (percussion). Cissokho was raised in Senegal by a long line of griot musicians. In West African culture, a griot acts as a storyteller, advisor, and praise singer by playing the kora, a 21- or 22-stringed bridge-harp from West Africa, and singing songs. This title has been passed down from generation to generation since the 14th century. Cissokho's mother and father both hail from a long line of griots, telling stories of celebrations, marriages, births, and other significant village events. After meeting his wife, who is from Pittsboro, NC, Cissokho decided to settle locally and share this griot tradition with the Triangle. Eventually, he met his current band mates and realized that they could create their own unique music by mixing modern instruments and sounds with that of the Senegalese traditional kora. Now they are Kaira Ba, which is a Mandinka phrase meaning "peace and love" or "the great peace." The Great Peace is a lively masterpiece that covers historical events of Senegal and modern day concerns. It begins with "Mbolo" (Unity), with percussion heavy beats and an optimistic rhythm. The lyrics discuss the significance of having allies and friends in our lives. Kaira Ba sends the message that people cannot be successful completely on their own; more can be accomplished with unity and working together with the lyrics, "No matter where you are from or who you are, we need to come together." "Talibe" (Our Lost Boys) comes from a melody borrowed from Cissokho's late mother, Mossu Keba Diebate. He wrote lyrics to match the melody that discusses orphaned children in Senegal. Through his lyrics, he's calling out to the Talibe as a reminder that all children should be honored and provided for. Other ideas shared by Kaira Ba give helpful reminders for all people in their everyday lives. "Yur Mande" (Compassion) talks about using compassion and understanding with those we meet. Cissokho says, "Everywhere you go, you have to take compassion with you. People aren't given wealth in order to keep it. You must share it." While the lyrics send some powerful messages and cultural stories, the support of the instrumentals provide an upbeat, positive vibe. Ancient West African sounds are meshed with a modern voice to create a whole new sound not typically heard. All of these elements combine to create a fusion of blues, jazz, and rock-n-roll. The hopeful dance grooves make this album appealing to those from all cultures and languages, truly uniting people through the magic of music. Get inspired by Diali Cissokho and Kaira Ba this Thursday, May 1 at The Pour House. The show starts at 8 Kaira Ba performing first. Visit Kaira Ba's website to learn more about the group and to purchase the new album.